Tell your Valentine how much you love them with these Valentine Bath Bombs. They make the perfect frugal, DIY gift for friends, family, and even your kids teachers. I made these bath bombs a while back for my girls and they LOVED them! 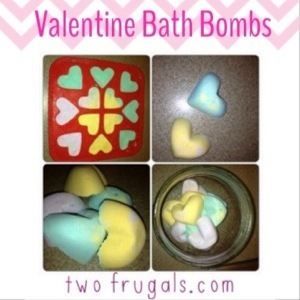 Just follow the simple steps below to create your own Heart Bath Bombs and attach a cute note that says your the bomb. Add 2 TBS Baking Soda to bowl. Then add 1 TBS Cream of Tartar and ½ teaspoon lavender or Essential Oil. Next, add your food color. (I would suggest that if using food coloring to color these, make sure you use non-toxic vegetable based color. Safer for everyone, especially for children). Stir it up and add a couple of sprays of water and keep stirring. You want to get it where it is just sticking together without adding too much water. NOTE: Only add a couple of sprays of water at a time or your bombs will lose their fizz. 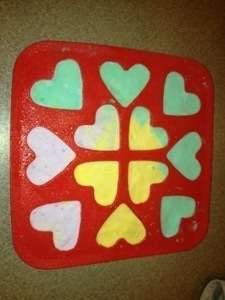 Put your bath bombs in a soap mold or ice tray, and leave over night to dry out. NOTE: The amount this recipe makes all depends on how big your molds are. You can really make them as large or as small as you would like. You can make them the size of a baseball or the size of your thumbnail. you can double the recipe and make more than four at a time. I decided to make one batch at a time and change the colors during each of the batches. When ready just drop your bomb in the bath you can watch it fizz as it releases its sent and colors your water! These bath bombs can stay good up to 1 year as long as they are stored in a dry, cool place that is out of the sun. ENJOY! !